Please find attached the Series Results which confirm the provisional top six standings reported previously. Congratulations to Neil Bellhouse (Manx Vikings Wheelers) who put together a superbly consistent set of results to secure a very deserved victory. He was pushed all the way though with the races very keenly contested throughout the series. Elliot Moore and Andy Brookes once again so close yet so far! Anna Christian (Team Scott Contessa MVW) added the Bikestyle Ladies Championship to her National Junior title. What a great year she has had , well done Anna!! My congratulations go out to everyone who has taken part this year. It has been very pleasing to see the standard of racing improve throughout the season. I would particularly like to mention the great improvements made by Jamie Fletcher (Appleby Ellan Vannin), Andy Radcliffe (Manx Viking Wheelers), Guy Hatton (Team Manx Telecom). Well done one and all, we will confirm the date of the presentation very soon. It was great to so many in retro kit and fancy dress, again thanks to all for making a big effort. Team Pie in particular were stunning in their Marvel Comics Team kit with Captain America and Ironman also featuring quite well in the race, although Ironman’s flames were extinguished somewhere on the Ballamoar Straight! The specially kitted out and liveried Team Pie Van made a massive visual image in the Jurby Parade Ground Car Park! Team Pie take the prize for best fancy dress. The retro kit on display was thought provoking. Richard Fletcher displayed his Merseyside Divisional Champion jersey. It was way too big for him when he won it but it fits nicely now. Other blasts from the past were ‘pocket rocket’ Steve Joughin’s Moducel kit, Russian Olympic attire, La Vie Claire, DeutcheTelecoms awesome pink attire, various French team kit. Bonson Johnson modelled a particularly fetching outfit together with original Oakleys and hair net head protector. Best retro award was decided by the crowd watching who thought that the National Champions jersey modelled by Rob Holden was best particularly as he actually won it back in 1990! There will be some good photos posted shortly. Oh yes………there was also a race on! The amalgamated groups 1,2 & 3 got their heads down from the gun and maintained a steady and fast pace throughout chased hard by the series overall contenders. The overall contenders had to get to the front if they were to have any chance of over hauling Neil Bellhouse who was marshalling sitting on a points total of 227. It turned out pretty close with the contenders just failing to make contact some 40 seconds behind the fast moving long markers. The race was lead home by RL360 upcoming talent Owen Dudley who took the sprint from the much improved pairing of Andy Radcliffe (MVW) and Jamie Fletcher (Appleby Ellan Vannin). First lady was Elizabeth Holden (RL360) who gave the lads a hard time in the sprint taking fourth ahead of Graham Bradley (TMT) with ladies National Junior Champion Anna Christian completing the top six. Provisionally Series Winner is Neil Bellhouse with 227 points. He was reported to be seriously nervous whilst marshalling! Ell Moore edged second spot on 223 from Andy Brookes on 222 with Captain America in fourth on 219. Johnson and Ironman make up the top six. The Ladies competition was stolen at the very last round by National Champ Anna Christian from Laura Wasley. NOTE ALL RESULTS ARE PROVISIONAL THEY WILL BE RATIFIED ASAP. Thank you to all who entered the series I hope you enjoyed the racing. We hope the mentoring was beneficial and thanks go to Rob Dooley, Rob Holden, Warwick Sanderson, Marty Warren & Pete Gage who have all acted in this role. Thanks also go to those without whom it could not happen, Gerry Jones and team from St John Ambulance, Lead Car pilot Ja Cockram, Moto marshal Rich Cuffwright and Graham from Manx Timing Solutions. I’m sure I will have forgotten to mention someone….so thank you all! Biggest thanks go to Gav and the team at Bikestyle who have supported this series for many years, give them your support by buying local. We will let you know the date of the presentation very soon and I will ratify the results asap. 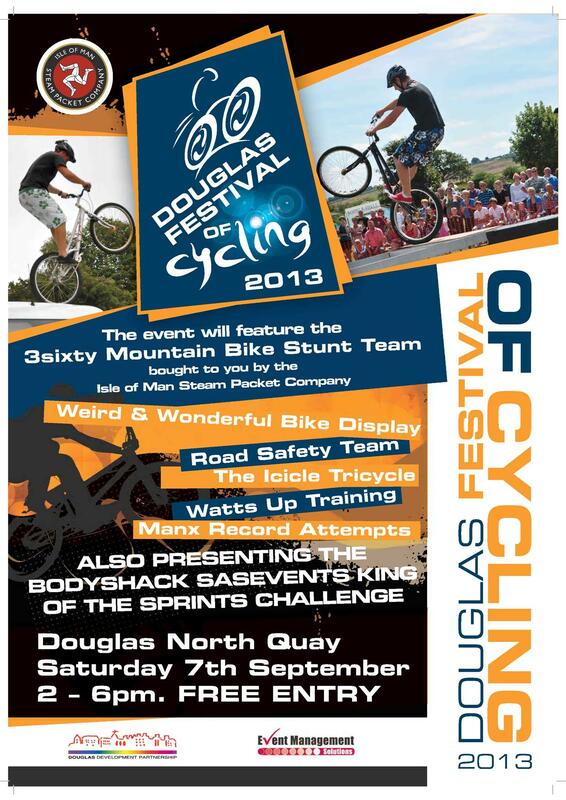 Please find details of an exciting event which is new to Douglas and to cycling on the Isle of Man. If you haven’t already seen the 3sixty Stunt Team you will be amazed at what is possible on a bicycle! Lots of other attractions including the debut of the Bodyshack SAS Events King of the Sprints Challenge. Just who will lay claim to being the fastest on the rock over 250 metres??? No room for excuses about head winds or being baulked in the finale as all races are scientifically measured on static Watt Bikes, under cover to a rockin’ beat. No entry forms required just turn up,ride and enjoy the show. You can race as many times as your energy and time allows. This shouldn’t detract from your performance in the following days E2E. Call down before/after you have signed on. Watts Up Coaching (Andrew Roche) will be on hand to provide advice and tips, who knows Rochie may lay down the first ‘target time to beat’! Ritchy, Andrew and Shim look forward to seeing you down on the North Quay. After a great deal of consideration it has been decided to run the final and deciding round of the series on Thursday 29th August. Start time will be slightly earlier than usual at 6.45 pm. This also means that the Prize Presentation, which was due to be held Sunday 25th August, will have to be re-scheduled. This will advise in due course. The rain in itself is not a problem although it is miserable for all concerned. The trouble is that some of the roads we use are subject to localised flooding which means that the carriageway width is reduced. This causes a substantially increased risk to competitors and motorists alike. The coast road and Sandygate are particular ‘hot spots’. If anyone slides off at Sandygate the chance of collision with other competitors and road traffic is very real. This puts the competitors, public and marshals into a high risk situation which we have to avoid. The event has been rescheduled for Sunday 25 August. Start time 10.30 am. The series presentation is also on Sunday 25th at Bordello Wine Bar from 8 pm. Please find attached the Ratified Results from last week’s event and the current Series standings. Last week’s event was a disrupted due to a number of riders starting in the incorrect group, thus gaining an unfair advantage. This led to Groups 4,5 & 6 being red flagged and restarted. Three riders were relegated from their finishing position to the end of the field due to the infringement. The long markers made a massive effort and managed to stay away this week with Mike Clough (MVW) taking a maiden victory alone from Mario Ricciardi (TMT) holding on to second spot 45 seconds behind. The main bunch sprint was headed by Tom Black (TMT) taking 3rd, Robin Garry (MVW) 4th with Juniors Jake Kelly (MVW) and Leon Mazzone (TMT) making up the top six. Youth, Nathan Draper (RL360) had another strong ride to finish 7th. He has made great progress this year and now regularly starts with the Scratch Group joined by his RL360 team mate Matthew Bostock. 1st Lady home was Laura Wasley (Team Scott Contessa), followed Youth Phoebe Ferguson (RL360) and UK Junior Champ Anna Christian (Team Scott Contessa). The race was held in good but windy conditions., with riders struggling into a strong headwind on the Southerly leg to the Cronk then ‘spinning out’ on the return to Sandygate. The scratch Group, driven by Team Raleigh pro Mark Christian, made contact with the bulk of the race on the Ballamoar Straight and the ‘lined it out’ to the finish . So the Series will be decided on the last event. In the mens category Neil Bellhouse is in a very strong position. He marshals this week and will end the series on 227 points. Contenders for the title are Elliot Moore (MVW),Dave Holland (MVW), Andy Brookes (MVW), Adam Johnson (MVW), Martin all (Team Pie & MVW). The winner of the ladies series will come from Laura Wasley, Anna Christian or Natalie Arrowsmith. This means that the men’s contenders must contest the finale of this week’s event to be in with a chance of overhauling Bellhouse. There will be no hiding place in the bunch. There are a further dozen or so who could make the Series top 10. So all groups cannot afford to ‘sit in’, the key is to get to the finale to be in a position to contest the sprint either to defend your current position or attempt to jump over your rivals. Handicaps will be set to ensure that all Groups must race ‘full gas’ to be in with a chance. Don’t forget the last event is a ‘dress up day’. Fancy dress or retro kit is encouraged with a special prize for the best dressed! It is rumoured that we can expect the appearance of some masked ‘super heroes’ on the start line. See you all Thursday…..Good luck!! Big thanks to all the marshals, Gerry Jones (St John), Rich (Bikestyle Moto), Ja Cockram (Lead Car), Rob Quine for collecting signs (saved me from a soaking cheers!). Again its Bikestyle that makes it happen, give them your support. The current Series positions are now also shown on the Manx Timing Solutions website. Yet another good weather evening at Jurby last Thursday and another great turnout. Thanks to all of you for your support with this series. The start Groups were spaced further apart which meant that the race only came together on the last lap. Unfortunately the scratch group, driven by Mark Christian did not make contact. I will move them closer for Event 5. The sprint was well ordered this week. Neil Bellhouse timed his run to the line perfectly and was 3 bike lengths clear of Mark Harrison at the finish with Andy Brooks coming up fast in third. It is good to see improvements in rider performance as the series progresses. Well done Andy Radcliffe (noted as Paul in the results) and Andy Jones who stayed with the bunch and contested the sprint this week. Jamie Fletcher (first Junior) and Nathan Hinks (first Youth) continue to impress with solid performances that auger well for the future. The series positions are quite interesting. Elliot Moore and Neil Bellhouse are looking strong but watch out for improved positions from Andy Brookes, Trevor Kirkwood, Peter Gage and John Coleman. In fact a good result from any of the top ten or so could see them feature prominently at the sharp end of the overall results. See you all Thursday for event 5. The weather forecast is not looking too bad. Note that due to holidays there are now a limited number of spaces available for entry on the line. Please let me know in advance to reserve your place. Once again thanks to Rich and Tony the Bikestyle moto marshals, Ollie Last on Lead Car duty, St John Ambulance and all the marshals. Not forgetting Bikestyle for making it all possible. DATE FOR YOUR DIARY; PRESENTATION EVENING IS SUNDAY 25TH AUGUST AT BORDELLO WINE BAR.